More than a motto for the Boy Scouts of America, “be prepared” is sound advice for anyone going to InfoComm—the biggest event of the year for commercial integrators, consultants, technology managers, and end users. To help with your prep, SCN spoke to InfoComm veterans to find out what they hope to see on the show floor this year, what their strategy is for covering the show and using the knowledge they learn, and how a newcomer could best take advantage of the experience. Alexis La Broi, CTS, Avitecture Systems Consultant, Avitecture, Inc.
What to See: I’m looking forward to seeing the different digital signage offerings—I have customers who want this type of hardware and software, and I want to bring them the best solutions for their specific applications. I’m also interested in seeing room sensors and analytics systems. IMCCA Emerging Trends has a speaker on Tuesday that will discuss “Smart Buildings, Sensors, and Tracking,” which fits perfectly into technology that I am interested in this year. I tend to pick classes that help me plan ahead for a customer need. I am very excited to attend this year’s AVIXA Women’s Council Breakfast on Thursday morning—this year’s focus will be on developing our local AVIXA Women communities. Show Strategy: We’re sending members of our sales and operations teams to the show this year to gather information to bring back to the rest of the team; we will set some appointments with manufacturers, and we’ll make a plan to divide and conquer the show floor. Tips for Newbies: Newcomers to the InfoComm Show should attend the First Timer’s Orientation on Tuesday at 2 p.m. and/ or the Early-Bird Tour on Wednesday at 8 a.m. They should also get lots of rest the week before the show, because, if they’re doing the show the right way, there’s lots of walking, early mornings, and late nights! It’s a great week of learning, technology, and networking. What to See: I am excited to see the continued development towards the Skype for Business/Teams native hardware solutions. These solutions will enable us to provide larger rooms access to the widely adopted collaboration platform with enhanced camera capabilities, as well as interoperability with many of our larger room system microphone solutions. Direct-view LEDs continue to get smaller in pixel pitch and more affordable for spaces that dictate a larger image size than producible in the LCD/OLED/QLED devices. We’re excited to see these solutions further adopted as move forward standards. Touch technologies continue to drive collaboration, whether that is the “click to join” solutions via touch panels and video conferencing systems or larger format collaboration displays. I’m excited to see the continued developments in interactive displays, and how these continue to reform our huddle rooms and small and medium collaboration spaces. It will be interesting to see how well they work with peripheral devices for video and audio solution add ons. I think there is certainly still a transition to the “cloud.” We have heard this in video collaboration for years, however now more than ever we are hearing this in areas such as programming, system monitoring, signage management, and others services that we continue to build into our managed services offerings. I also think we will begin seeing a shift from the traditional LCD video wall solutions for large display needs to a variety of pixel pitch direct-view LED solutions. As pixel pitch continues to get smaller, the predecessor LED sizes are getting much more cost-effective for many of our large display needs. Show Strategy: This year is a bit unique with regards to the overall company strategy around the InfoComm. As Neurilink grows into our “one company/one brand” here in the Northwest, in regards to the acquisition of Blue Sky Integrated Technologies in 2017, we are using this year’s InfoComm to get all of our sales and engineering teams together for the first time. We will have a lighter take on the conference this year, in regards to absorbing each other’s time, enjoying connecting with our valuable manufacturer partners, and better understanding our overall team’s strengths and talents moving forward. As we do every year, we will also connect with our PSNI Affiliate partners to take some additional time to strategize in the industry, as well as thank each other for resources and shared projects we have completed over the past four to six months. What to See: I don’t see this as a year for pioneering technology. Instead, I see it as a time for manufacturers to improve or update product lines to ensure they’re meeting the needs of integrators and end user. Yes, there will obviously be new technology, but I don’t expect to see anything life changing. That being said, the display manufacturers may surprise me. The price of their products continues to decrease while their technology is getting more innovative—it’s an unusual situation. This year, I think we will see a shift towards recurring revenue models. I know this is trending with integrators now, but I think we will going to see more manufacturers making the change—this is especially true as AV integrators are using more products and services that are software- and IT-based. Show Strategy: I believe you reap what you sow. Attending InfoComm is more than a business necessity—it’s also a privilege. In order to attend, our sales team has to meet or exceed their goals. The work doesn’t stop there. Each person attending needs to put together a list of topics that they are interested in and will enhance their value to the company. From there, we make a plan with must-see manufacturers and classes. Each person has their own strategy, but we all come back from the show with more connections and knowledge than we previously had. Tips for Newbies: My advice to newbies is to not let yourself get overwhelmed. Sit down and map out the show floor, and don’t spend more than 30 minutes with a manufacturer. Take classes and interact with your instructor—you’ll get so much more out of a class that way. Don’t bring home a suitcase full of garbage—skip the paper handouts and ask for a digital version instead. What to See: Our customers turn to IVCi for low-cost, easy-to-deploy, and easy-to-scale huddle room solutions. To continue to offer best-in-class designs, we look forward to evaluating advancements in this increasingly popular area. Also, we hope to see improvements in IP video distribution leading to increased functionality, improved quality, and lower costs. We’re expecting the momentum towards platform-based environments to continue to grow and afford greater interoperability across devices. Show Strategy: Divide and conquer is our plan. There’s never enough time to cover everything at InfoComm, so each member of the IVCi team will be focused on a specific area. When we return from the show, we will meet and everyone will present on their specific segment. We will then define the key takeaways from the event and determine how these trends affect IVCi’s strategies. What to See: We are excited to see examples of partners converging their technologies to create new platforms that optimize meeting environments and experiences. We are expecting to see cross-pollination with display manufacturers and furnishing vendors, as well as major UC providers and collaboration solutions, integrated to provide persistent, visual collaboration walls. We also expect to see a continued shift to designing with user experience in mind. Hence, the above technology convergence. Show Strategy: Our customers look at AVI-SPL as not just an integrator, but as a strategic partner throughout their entire project lifecycle. Our goal is to provide guidance to end users and enterprise clients alike about which technologies are having the greatest positive impact on businesses undergoing digital workplace transformation. 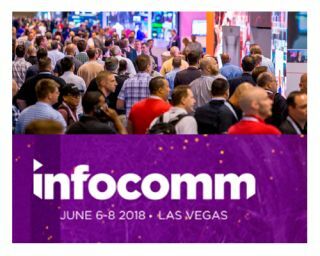 To help with this, we’ll be offering guests curated tours of our preferred technology partners exhibiting at InfoComm, allowing attendees to meet with product experts and discover which solutions fit their needs. What to See: I’m really excited about any technology that will support cloud-based software conferencing. I’m also interested in interactive/gesture-based technology and voice-activated control. I’m always on the look out for things I didn’t know how look for—new releases, new manufacturers, and so on. Show Strategy: This isn’t my first rodeo—this will be my 18th year at the show! I’ve picked up some tricks along the way. Since I live in NYC area, I tend to stay away from the larger booths since we have access to several manufacturers’ headquarters and experience centers. Plus, those companies have large sales staffs that regularly call on us. I try to look for things I can’t easily see during the year, and especially for manufacturers I have never heard of. Tips for Newbies: Carry water with you! The show floor is dry and walking around will dehydrate you—drink a lot of it and wear comfortable shoes. One of the other things that I would look for, and I haven’t seen anybody do it yet, would be for somebody to build a true mixer off of a DSP platform. If I can take all the feature sets in an Allen & Heath mixer or a Yamaha mixer, or any number of other audio board manufacturers, and I can build it into a control surface that runs off the same DSP platform that I use—nobody does that. We do integrations for higher end spaces, such as multi-purpose rooms, auditoriums, and the like; we always have a need for conferencing, and we always use a DSP platform. There are things that you can do with a mixer that you can’t do with a DSP platform. Show Strategy: We typically try to send people that are interested in becoming subject-matter experts. These are people that are going to go for a deep, deep knowledge in a specific area—whether that’s LED, whether that’s audio, whether that’s content creation, control, etc. We believe in having subject-matter experts who are going to lead us down the technology runway toward implementation. We look at what customers are attending, what manufacturers will be there that we need to create deeper relationships with, and which current projects are going on. We take great pride in being able to walk our clients through the show and setting up meetings with manufacturers and their engineering staff, so we can choose the correct solutions for them. We very much map everything out ahead of time. We’re there to learn. Tips for Newbies: This will be my 30th InfoComm. I’ve never missed a year. My advice to new people at InfoComm is to try to see everything, but focus on something. It’s great to see the breadth of the market, everything it can be, and everything you want to learn about, but take the time to become an expert at something.